The kitchen is the heart of the home, and it’s one of the most used rooms – whether you spend time cooking, gathering or spending time with your family. We are actively using the space, constantly opening and making things, and it’s easy for it to become a bit cluttered and disorganized. (For some, that may be an understatement). 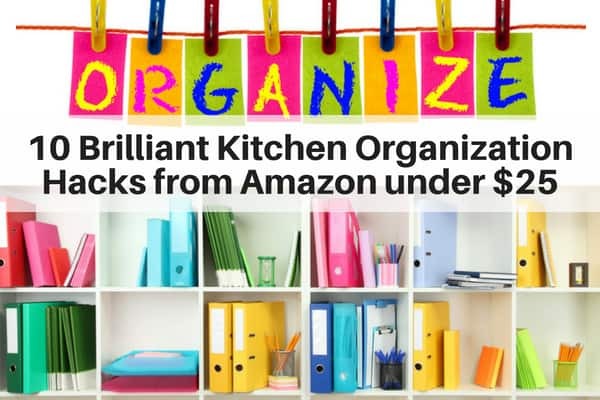 So, I wanted to provide some organizational hacks that will help make your kitchen less cluttered and less messy. These tips will make it faster and easier to find items. And, they will prevent your kitchen from getting more cluttered. It’s amazing how these tips will help whip your kitchen into shape…and help keep it that way. And, you’ll be happy to know that you can easily purchase these items on Amazon, and they’re under $25. This is a great way to organize your pantry and easily find all your can goods. Whether it’s soups, drinks or just canned goods, this makes it super easy to find what you’re looking for. And, if your kids/other family members need to grab something, it will keep everything nice and tidy. 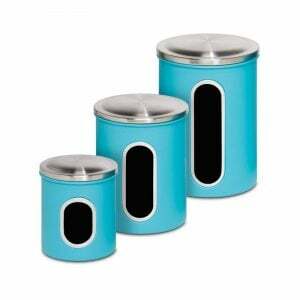 These are stackable, so you can buy multiples if you have a lot of canned goods. This pan organizer helps save cabinet and countertop space by organizing your pans and lids. I don’t know about you, but when I grab a pan, I often knock over a few others in the process and make a lot of extra noise. Now you can just grab the pan you need. Easy peasy. This is a great way to organize you bakeware. It’s a set of 2 organizers, so it can hold you pots and pans, as well as cutting boards. It comes with rubber feet so it won’t scratch your surfaces. You can either use these in on your countertops or inside your cabinets. These can also be used as drying racks. This is a brilliant idea. When I was growing up we always had a “junk” draw. It would have EVERYTHING in there – pens, scissors and tons of doodads (is that a real word?). Anyway, it was always hard to find everything, and super easy to hurt yourself. And, of course the drawer always got dirty. Well here’s a handy way to organize everything. And, it’s adjustable. And, it’s washable. Love it. These food storage containers are so convenient because they’ll keep your food fresh and keep you organized at the same time. You can easily what’s in there…and how much. So, you know when it’s time to replenish. Get your flatware organized with this bamboo drawer organizer. It’s so much nicer than those cheap looking plastic ones. This one is expandable and contractable, too…so you can make it into a 8 slot organizer or a 6 slot one pending on your needs and size/shape of drawer. These can be used for the kitchen as well as bathrooms, family rooms for any room where you need to organize items. This closet door organizer will save you closet space as it can be mounted to the closet door. It’s perfect for plastic wrap, aluminum foil, wax paper and plastic bags. These are super clever and convenient. You can label all your mason jars and/or plastic containers. You’ll be happy to know that these are washable and you can easily rename them. Okay, the utility closet drives me up a wall since everything flops around. Here’s a great solution to avoid this. This will hold your broom, mop and more in place. This can also be used in the garage and other areas to hang a whole bunch of items. When I get plastic bags from the grocery store, I always save them and reuse them. But, they can make a mess if you don’t have an easy and convenient place to store them. You can hang this one behind a closet door or under the sink – where ever it makes the most sense for you. Bonus: I just wanted to throw some fun colorful canisters. I love aqua so here are some great ones on Wayfair.